Add the oil, sugar, salt and yeast to the water and allow it to rest for ten minutes. Pour into a bowl with about two and a half cups of the flour, and mix with a spoon until all of the flour is incorporated. Turn the dough ball out onto the table and knead in the remaining half-cup of flour. Knead a couple of minutes longer. Pour a couple tablespoons of oil into the bottom of the bowl, spin the dough ball around in it to coat, then leave it to double, about forty-five minutes. If you are using charcoal, start the grill now. As soon as the coals catch fire, long before they are grey, shut the lid on the grill to heat it up inside as much as you can. If you are using propane, start the grill soon after the dough is rolled out. Punch down the dough and divide it into a dozen portions. (Eight for large pitas, sixteen for minis.) Form each portion into a ball. Roll each ball out thinly, flattening with your hands before evening out with a rolling pin. The dough will be more delicate than tortilla or pasta dough but can be fixed if you tear any holes by either pressing the pieces together or re-rolling. Place the dough circles on oiled cookie sheets to transport them to the grill. Spray each with a light coating of olive oil. Place damp tea towels near the grill. Silicone tongs will also be handy. Grill them: The baking time will vary according to the temperature of the grill, and so will the pitas. If the grill is quite hot- 500F or greater, it will take about a minute on each side and a bubble will form inside the pita to make a pocket. If the temperature is cooler, say 350F, it will take about three or four minutes per side. Try to close the lid on the grill as soon as you put the pitas on to keep the "oven" hot. As soon as there are grill marks on each side they are done. At a lower temperature the big bubble will not likely form so you will not get a pocket, but your flatbread will still be soft and delicious. As soon as you take them off the grill, wrap the pitas in the damp tea towels to soften them, at least fifteen minutes. I shared this recipe with Full Plate Thursday, Thriving on Thursdays and the Weekend Whatever. 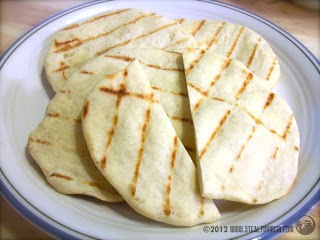 We would just love these homemade Pita's, they look so simple and delicious. Hope you are having a great week and thank you so much for sharing with Full Plate Thursday.